Do you like Air Wolves Flight? Share it with your friends. 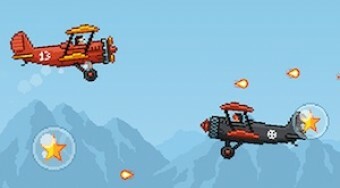 Air Wolves Flight is a great aerial shooter in which it will be your task to fly with a small biplane sky, collect stars, bonuses in the form of shields and shoot down enemy planes. Watch out for enemy missiles as soon as one of them hit you, so your plane falls into the water and the game ends for you.